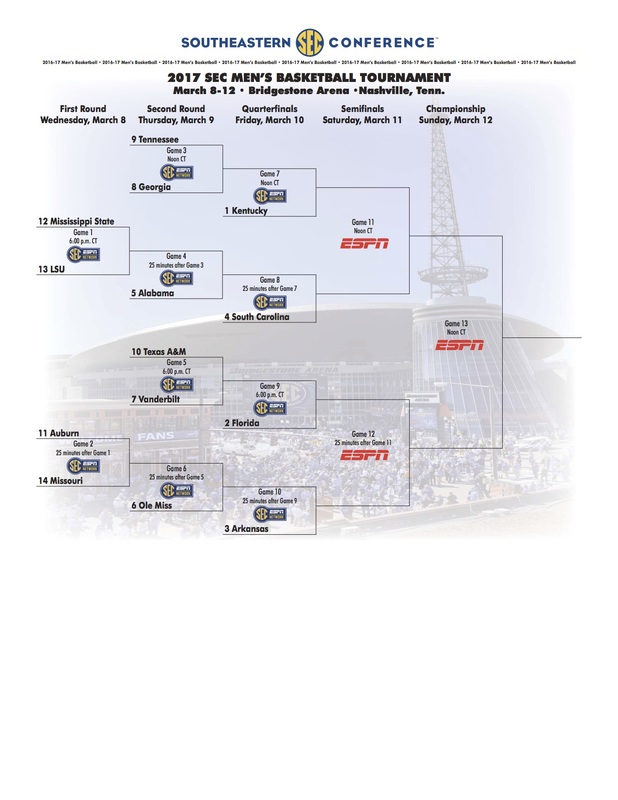 Here is how to watch the SEC men's basketball tournament. The 2017 Southeastern Conference men's basketball tournament will be played from March 8–12 at the Bridgestone Arena in Nashville, with the tournament champion receiving the SEC's automatic bid to the NCAA tournament. Kentucky is seeking its 30th conference tournament championship and its third straight. No other SEC team has won more than six tournament titles. Kentucky enters March as a strong candidate to return to the Final Four once again. The conference could get four teams in the tournament—Florida, Kentucky, South Carolina, Arkansas—while Alabama, Georgia and Ole Miss need to do some serious work to earn a tourney bid. See a full bracket for the upcoming tournament below. Live stream: Watch the games online with WatchESPN.